Tens of thousands of Muslims have been killed. Thousands more are displaced or unaccounted for. The oppression being meted out is horrific. Even children are not being spared in the regime’s onslaught. 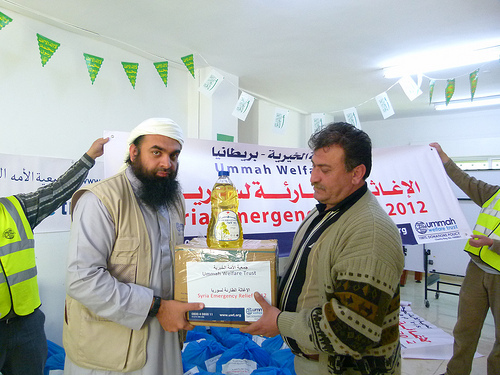 Ummah Welfare Trust is working inside the country, providing dry food rations to widowed and orphaned families. The charity is also working on the border with Jordan, providing relief to refugee families fleeing the oppression. Ummah Welfare Trust urges its donors to give generously for our brothers and sisters in the blessed land of Sham. As Muslims, the current situation obligates us to respond. Mafraq, Jordan: 500 more emergency packs arrive on the Jordanian border to be distributed to Syrian refugee families. Alhamdulillah, donors in the UK have been donating in the way of Allah swt generously. UWT already have 4,000 more emergency packs on the way to help thousands more and a shipment of more than 35,000 aid packs coming soon after inshaa-Allah! Above: Shaykh Muhammad (UWT Trustee) has travelled out too, to personally overlook the aid distribution and speak to Syrian refugee families regarding their needs. 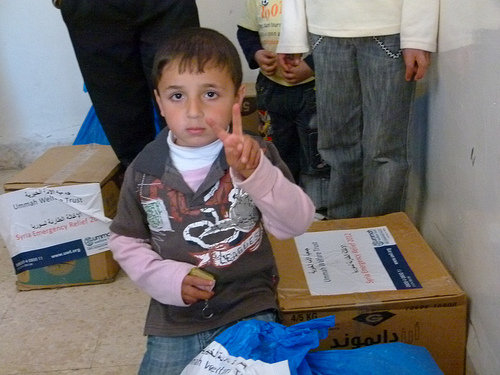 Above: Alhamdulillah, Ummah Welfare Trust's response to the families of Syria puts a smile on a young boy's face. Above: A brother takes away 2 emergency packs for his own family and another family who could not attend themselves. Above: Shaykh Muhammad Ahmad (UWT Trustee) on the ground in the blessed land of Shaam distributing aid to families who have suffered so much. These emergency aid packs come as a great comfort to them in their time of desperate need. Above: The widows of Syria who have lost their breadwinners have really suffered. In the absence of a husband who would normally provide them basics such as food for the whole family, these UWT aid packs are a lifeline - food and hygiene items which we often take for granted. 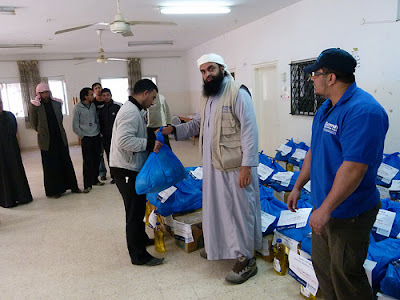 Above: A brother takes away a UWT emergency aid pack to his needy family. Above: A victim of the atrocities in Syria tells us his story of how he was held down by soldiers and beaten on his face continously with a rifle. His crime was only to serve as a medical assistant in a Syrian hospital.The left side of his face (not seen in picture above) was permanently marked. Above: We heard from some widows of Syria of how their innocent family members were brutally murdered in the streets of Dimashq and Homs in Syria. Above: Whilst listening to our sister cry and plead for help, noone can hold back their tears. This reminded us of the great eras of Islam when the likes of Umar (rad) made intentions to Allah (swt), not to let a single widow go without being provided for. Alhamdulillah, Ummah Welfare Trust donated on behalf of the Muslims of UK towards these widows and intend to support thousands more widows and needy families of Syria like these. Above: Alhamdulillah, Allah swt gave us the opportunity to visit a local orphanage and bring back smiles to the faces of these young traumatised children by gifting them with small ride-on toys. Above: Hamza, a young blind boy, who had just beautifully recited some Qur'aan for us, awaits his turn patiently. Above: A young boy thanks UWT trustee, Shaykh Muhammad for gifting him, on behalf of the donors of the UK, with a brilliant toy. Above: This young girl, studying at the orphanage, was overcome with happiness. Above: The young orphan children could not wait to try out their new toys! A representative of the Syrian refugee families thanked Ummah Welfare Trust over and over again for coming to the aid of his people. He prayed to Allah swt from the bottom of his heart, to reward Ummah Welfare Trust and all its donors and support. Above: The atrocities in Syria have been unbearable and have left thousands of Muslims in desperate need. Alhamdulillah as we have seen time and time again, the Muslims of the UK have come forth and are responding to the cries of the Muslims of Syria. Here, Adam bin Yusuf (A UWT representative from the UK), prepares to distribute much needed emergency packs to the Syrian refugee families. 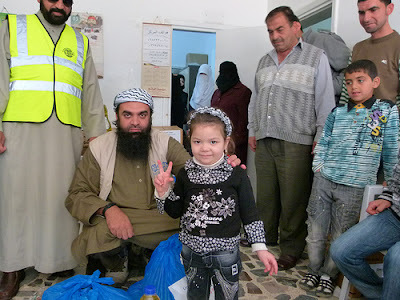 Above: Adam bin Yusuf and Shoyeb Adat (UWT UK representatives) commence aid distribution to the Syrian refugee families. Above: A Syrian girl prays for peace in her homeland. Above: A young traumatised boy expressed his gratefulness towards UWT's donors for providing his family with an emergency pack. Above: Families who have fled from Syria have left everything behind, and even those who had jobs and a livelihood, now find themselves in dire need of basic essentials such as food and hygiene items.